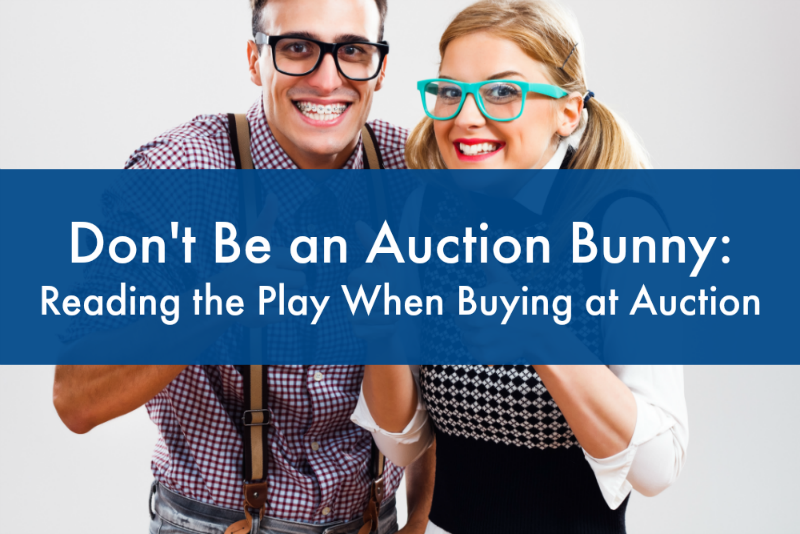 Auction bunnies are home-buyers duped into bidding at auctions when they have no chance of being a successful buyer. The auction bunny reaches their maximum price at the auction before the price even hits the seller's reserve. Not only do these poor bunnies often get their hearts broken, they also lose thousands of dollars in 'due diligence' expenses - such as building reports, pest reports, strata reports and legal expenses. Here's what happens: an auction bunny asks the agent, "How much will this property sell for?" The agent gives the standard bunny-trap reply - they quote a price around 10 to 15% below the seller's reserve price. For example if the seller want a million dollars, the auction agent will say "We're expecting bidding to start from around $850,000". If the auction bunny pushes the agent, saying something like, "Are you sure? Do you really think it will sell for such a low price?" the agent will say something like, "The sellers are keen and will meet the market on the day. The market sets the price". It beggars belief that business is done this way. It's heartbreaking to witness someone go through the Bunny process. It's downright infuriating. But, welcome to the auction system as practised by thousands of agents. As a genuine buyer you must do your best to protect yourself against the bunny tactic. When it comes to misleading prices quoted by agents, believe nothing and check everything. The agents are right on one point - the market will ultimately set the price. If you are lured to an auction by what seems like a low price quote be assured, you won't be the only buyer looking for a bargain. You and the other hopeful bidders have been hooked by 'bait pricing'. The more you inspect, research and follow the sales results in your chosen area, the more knowledge you acquire. And knowledge really is power. If your opinion of value is higher than the agent's quote, you have probably stumbled on a bait price. At least you know before you waste thousands of dollars on reports, checks and searches. Ask other agents for their thoughts. These agents will have a fair idea of true value. Many times, other agents will tell you the truth about their competitor's properties - they've got nothing to lose or gain. Be careful though, some agents will run down any property that is not with their office, however this is an easy tactic to detect and you'll rarely be fooled by it. Also attend other auctions. Ensure you understand the bluff and bullying tactics commonly used at auctions. Don't be frightened. Decide what the property is worth (to you) and stay calm at the auction, or find a friend or relative who can bid on your behalf. You can also make an offer before the auction. By law, all agents must pass on all offers to owners. Follow these simple yet powerful points and you'll rarely be an auction bunny. Good luck!